A total area of 2500 m enables us to work through a mock-up system. The two construction halls are equipped with the latest machines located in the town of Purmerend, just a few minutes north of Monnickendam. Here, some 30 dedicated carpenters use their unique eye for detail to create perfect megayacht interiors. 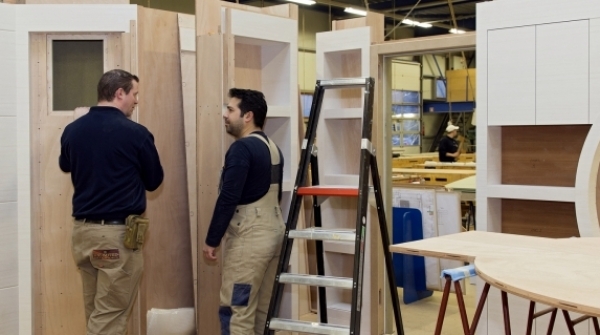 While a hull is under construction at Hakvoort Shipyard in Monnickendam, we build a full-size mock-up of all floor areas and associated hull framing to exactly define the space allotted to the interior so we can position furniture as it is built. All galley, navigation, entertainment, and other equipment is pre-installed in the mock-up to assure perfect fit before it is brought aboard. This system allows a client to walk through the interior, making adjustments far from the activity on the yacht. With the client and shipyard approval, the furniture is removed, meticulously finished and installed onboard.